SEC Rule 10b-5 prohibits securities fraud, including insider trading through the purchase or sale of securities on the basis of material non-public information. SEC Rule 10b5-1, which was adopted in 2000, allows insiders to transact in their company’s securities by establishing prearranged trading plans. Rule 10b5-1 trading plans provide an affirmative defense to insider trading allegations if the plan is entered into (i) in good faith, (ii) while the individual or issuer is unaware of any material non-public information, (iii) with specifications regarding the number of securities, price and date of future transactions or a formula for making such determinations, and (iv) with prohibitions on exercising any subsequent influence over any person executing the plan. In effect, Rule 10b5-1 provides an affirmative defense designed to demonstrate that a purchase or sale was not made “on the basis of” material non-public information. The rule provides a safe harbor for “insiders” (i.e., executives and directors) who are buying or selling company stock, as well as public companies that repurchase shares through buyback programs, to make trades during periods where they are aware of material non-public information or during “black-out” periods during which trading is otherwise prohibited. As a result, many executives have adopted Rule 10b5-1 trading plans that govern the sale of their company securities. When properly administered, Rule 10b5-1 trading plans benefit both executives and companies by reducing the risk of litigation alleging insider trading, making it easier for companies to administer their stock programs, and allowing executives to diversify their assets while not sending unintended signals to the market. 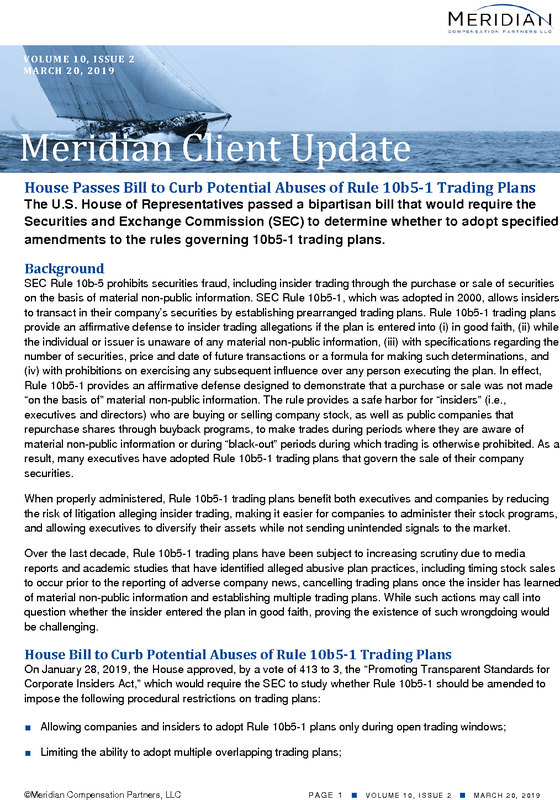 Over the last decade, Rule 10b5-1 trading plans have been subject to increasing scrutiny due to media reports and academic studies that have identified alleged abusive plan practices, including timing stock sales to occur prior to the reporting of adverse company news, cancelling trading plans once the insider has learned of material non-public information and establishing multiple trading plans. 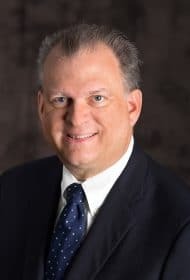 While such actions may call into question whether the insider entered the plan in good faith, proving the existence of such wrongdoing would be challenging. ■ Requiring boards of public companies that enter trading plans to (1) adopt policies covering trading plans, (2) periodically monitor plan transactions and (3) ensure that company policies address trading in the context of guidelines or requirements on equity hedging, holding and ownership. The bill requires the SEC to complete a study on 10b5-1 plans within a year of the bill’s enactment and issue a report of findings to Congress. After issuance of its report, the SEC must revise Rule 10b5-1 based on the results of its study, and adopt a final rule following a comment period. Meridian Comments. After the House passed the bill, it was referred to the Senate Banking, Housing, and Urban Affairs Committee. The high-level bipartisan support for the bill in the House suggests that the bill is reasonably likely to move forward in the Senate; however, whether the full Senate considers and approves the bill remains uncertain. Despite the administrative burden associated with the proposed legislation’s procedural restrictions on Rule 10b5-1 plans, corporate insiders and public companies are likely to continue to use the plans to gain the legal protection that they afford.